Plastomenidae used as subfamily to reconcile Paleo and Living taxa taxonomy. One is using Phylocode the other ICZN system. Higher order reconciliation necessary. Unassigned basal taxa will need to be assigned at a later date the basal Trionychids are highly unresolved. Georgalis, G. & Joyce, W.G. 2017. 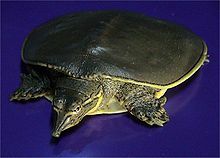 A Review of the Fossil Record of Old World Turtles of the Clade Pan-Trionychidae. Bulletin of the Peabody Museum of Natural History 58(1):115–208. Vitek, N.S. & Joyce, W.G. 2015. A Review of the Fossil Record of New World Turtles of the Clade Pan-Trionychidae. Bulletin of the Peabody Museum of Natural History 56(2):185–244. For more multimedia, look at Trionychidae on Wikimedia Commons.